Deceived by Julie Anne Lindsey. Publication: September 18th 2013 by Merit Press . Ever since she could remember, Elle has had to hop from town to town to keep up with her dad's demanding career as a corporate insurance agent. Each time, a reoccurring nightmare followed her wherever she went--until the day that the frightening figures haunting her at night became all too real. When news of a serial killer spreads throughout her new school, Elle worries that the Reaper has been leaving her his calling card in the form of cigarette butts on her doormat and an unusual ribbon in her locker. With the help of Brian, a boy she meets at a flea market, she discovers that this isn't her first encounter with the murderer and that her father has been concealing her true identity for the past twelve years. But despite her father's desperate attempts to protect her, Elle still comes face to face with the darkness she has been running from her whole life. Trapped in the woods and with help hundreds of miles away, will Elle be able to confront the Reaper and reclaim the life she lost? Tours. 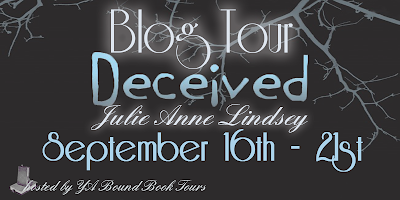 Click HERE to see the full blog tour schedule! 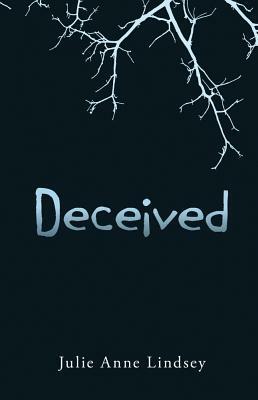 Deceived is a book that shows how much the brain tries to protect us. I can’t say anymore than that on the why’s of that statement. You will understand when you get to the end. It is full of suspense, action, nightmares, family, boarding school, boys, lots and lots of coffee, caffeine pills, fires, hiking, best friends, stalkers, serial killers, FBI and Marshalls, and did I say coffee?!? The very beginning of the book grabs you with Elle’s nightmare! Something haunts her and she doesn’t know why or what it is. Her dad moves a lot due to his “job”. So she never really hangs on to friends. She doesn’t sleep either due to her nightmares that plague her. As time goes on these nightmares morph into her living world. Elle drinks a lot of coffee and takes caffeine pills and runs on the treadmill often, so she doesn’t sleep for long to avoid her nightmares. Elle starts off her senior year at a boarding school. She has a roommate that becomes her best friend. Everyone should have a friend like Pixie. She is okay with Elle’s aloofness. She still tries to get her to go out and have fun. Then there is a serial killer thought to be in her area. There is this glow and this squeaking car that she sees and hears often that scare her. The glow is from someone smoking and that frightens her. Something is so wrong about it. That glow doesn’t come close, yet. I thought Brian was sweet and protective. She meets him before she started school. He shows up at her school and at first pretends like he doesn’t know her. He runs hot and cold with Elle. She finds out why later. If you follow the tour, Ms. Lindsey talks about Brian and who he is. You have to go and follow the tour because she talks a lot about the behind the scenes to the book and it just made the book all that much better. Elle is a hero to me. But you have to read the book to find out why. What she did is amazing and I would only hope that I could do what she did if I or my girls were ever in her shoes. That is gross on a whole other level to say that. This is a psychological thriller and mystery that keeps you wanting to know more. The killer is obsessed and will stop at nothing to get what he wants. But who and why does he want what he wants? My debut YA suspense released this week. When I mention it, people ask “What’s it about?” I have a sound bite memorized about a girl whose nightmare literally comes to kill her, but it’s so much more than that. Aren’t all books? DECEIVED is the result of a classic horror film festival too close to bedtime and an over-active imagination. Sometimes an idea gets under my skin and winds into my thoughts until it cannot be ignored. Eventually, I succumbed to the questions keeping me awake and spent 91,000 words sorting them out. This is the norm for me. As a reader, I get personally invested in stories and characters. I ache physically for their losses and rejoice in their triumphs. Often a plot twist I hate will put me in a foul mood in my real life and I grouch around until the situation is resolved. I’m like that. I take things to heart. When I write….it’s worse. The heroine: The questions percolating about fear and forbidden love took me into a number of awkward and terrifying places as I wrote DECEIVED. The story would work with a woman of any age, but I chose a teenage heroine because teenagers look more vulnerable than they are, and I wanted to use that against the villain. Never underestimate a teen. Teens are smart, fast, clever and insurmountably brave. They live in the moment, not in the future. I like that. A lot. And I wanted to surprise my villain. He’s gross. The villain: I grew up on Freddy Kruger and I think his influence is evident in my novel. Freddy was evil. Just evil-evil. There wasn’t a reasonable bone in his chargrilled body. Logic was useless on Freddy. He killed because he liked to kill. It was his thing. His hobby. His good time. I wanted a character like that. In my book, Freddy is alive. He has a different MO but the same insanity and I named him the Reaper. As I hinted at his presence in the story, I enjoyed the creepy thrill of knowing how much danger was just outside the reader’s frame. The sick, deadly anticipation fed my need for about 300 pages, but one can only pet the kitty for so long before they must pick him up and snuggle him. This is a terrible analogy because the Reaper is about as snuggly as Freddy, which is to say, not at all, but eventually, I had to let him take over a while. And he did. Moral of my story: Don’t mess with smart girls. Julie Anne Lindsey is a multi-genre author who writes the stories that keep her up at night. In 2013, Julie welcomes five new releases in three genres including her newest title, DECEIVED, a YA suspense from Merit Press, and her first cozy mystery, MURDER BY THE SEASIDE, book one in the Patience Price, Counselor at Large series from Carina Press (a digital imprint of Harlequin). Julie is a self-proclaimed word nerd who would rather read than almost anything else. She started writing to make people smile. Someday she plans to change the world. Most days you'll find her online, amped up on caffeine and wielding a book. Julie is a member of the International Thriller Writers (ITW), Society of Children’s Book Writers & Illustrators (SCBWI), Sisters in Crime (SinC) and the Canton Writer’s Guild. Great post like this must be highly recommended. It is so nice to read such wonderful blog. Thanks for sharing!